While the time off and vacation requests of your employees are pending, they will show as draft in the scheduler. Combining this feature with our Month view, you will have a rapid overview on all pending vacation or time off requests. The month view is accessible from the top of the agenda (orange rectangle). In this view you will clearly see all time off requests (red rectangles). As you ca notice in this picture, the 3rd week of June seems pretty popular for vacation this year (blue rectangle)! From this view, you can directly click on the requests and choose which ones you will approve and decline. 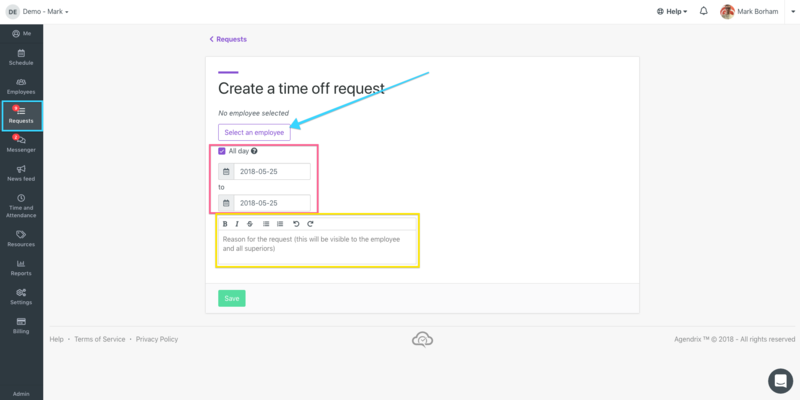 Click on "Create a time off request"